When I first began caving, I eagerly worked my way through as many of the caving classics as possible. Most of the ones I was able to get hold of were about exploration in France, a country whose caving regions I now know well. It was with great delight in the 1980s that I came across Underground Adventure by Arthur Gemmell and Jack Myers and promptly dived headlong into stories of exploration under the Yorkshire Dales. 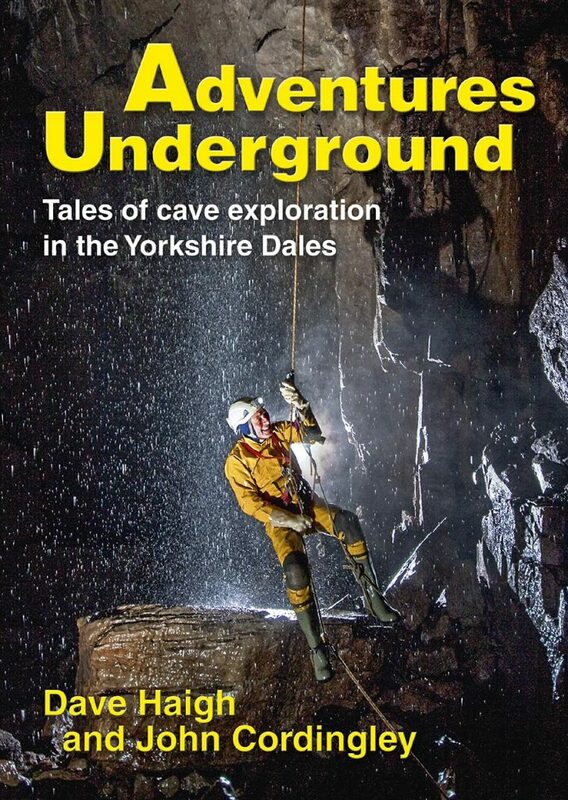 With the publication of Adventures Underground authors Dave Haigh and John Cordingley have provided a new generation of cavers with a series of tales to both inspire and entertain. The book is divided into 17 chapters telling the story of exploration throughout the Dales, from the hunt for the Penyghent Master Cave to the story of the classic diving discoveries in Notts Pot beyond the downstream sump, and other equally classic exploits. The book starts with an area map and an introduction in which they set the scene for later adventures and reveal some of what caving means to each of them and tell a little about themselves. Dave Haigh is a member of the Bradford Pothole Club and has been involved with many of their discoveries. He’s an inveterate digger, so we won’t have heard the last of his exploits. John Cordingley is equally well known in the caving world and is an experienced cave diver. I remember him having the heaviest diving bottles in the entire world on a sherpa trip out of Peak Cavern many years ago – but I’m told that fortunately John now often dives solo! The Introduction gives anyone unacquainted with the sport a quick and accessible run-down on how caves are formed and is drawn from this book’s predecessor, which still stands the test of time today, then jumps straight into the action, picking up where Gemmell and Myers left off. Many of the sections are headed with a list of the explorers involved, and there are plenty of clearly presented surveys and diagrams, the first of which being a clear and easily understood schematic diagram of Brants Gill Head hydrology. One thing that I particularly like about the book is its innovative use of schematic diagrams in the style of the underground tube networks familiar to many world travellers superbly drawn by the late Bryan “Scoff” Schofield. These are certainly not a gimmick, and present information in a visually attractive way that compliments the text. I always admire the skill that goes into producing a full survey, from the sheer hard work undergound to the graft of getting it onto the page, and the ‘tube’ diagrams don’t in any way detract from that. I loved them. The photographs in the book are equally good; nearly all of them are active ‘people’ shots, showing cavers in a variety of poses. They amply demonstrate the sheer joy of exploration and a caver’s interaction with the underground environment, whilst also showing respect for the unique beauty of every cave. Each photo has clearly been chosen with care to illustrate the story, and it was a delight to work my way through them, even spotting Mendip’s very own Peter Glanvill, in a great shot by Chris Howes, taken in Inlet 5 of Notts II. The photos also record, almost better than words can tell, the sheer hard work that goes into finding new cave, with a shot of Tim Allen working on the Lost John’s side of the connection in the Three Counties System, his face screwed up with effort. Whilst recounting tales of the sort of hair-raising exploits that we would probably all prefer to keep well away from our parents, the authors do acknowledge that not all trips go according to plan and that there are risks attached to any sport. Between them, Dave and John give an insider’s view of various rescues, all shot through with the irreverent humour than invariably accompanies a walk on the wild side. The final chapter, The Adventure Goes On, narrated by Dave with a contribution from John, is hopefully enough to whet the appetite of anyone new to caving and prove that the Dales is by no means all caved out. I think the same is true of all areas. Maybe there are no easy discoveries left, but with hard work – and the occasional stroke of good luck – there’s still plenty to find. Although I’m a Lancashire lass by birth and upbringing, the Dales have always held a special place in my heart. I still vividly remember being taken, at the age of four, into White Scar caves by my dad, who proudly showed me the hole through which my grandfather had emerged on one of the first exploration trips into the cave. At the time, my grandfather, who died well before I was born, was the landlord of the Wheatsheaf in Ingleton in the 1920s, and was a keen caver, so much so that he once lowered his daughter, my aunt, down a shaft in a bucket when she was a small child, so she could report back on what was at the bottom. We still have no idea which shaft this was! Unsurprisingly, he got a major bollocking from my grandmother. Equally unsurprisingly, my aunt hated it and vowed never to go down a hole in the ground again. When my cousin came to University in Bristol in the 1960s his mother made him promise not to join the caving club. He didn’t, but her attempt to extract the same promise from me was met with less success. At the age of four, I’d wanted to go beyond the First Waterfall in Whitescar, and when I was finally able to do that, and wriggle through the upwards squeeze into Battlefield, I was so happy. Whenever I recall that day, it makes me think how much my grandfather would have enjoyed seeing more of the cave. And I’m damn sure he would have enjoyed Dave Haigh and John Cordingley’s Adventures Underground. Wild Places Publishing have produced the book, and I don’t think there’s anyone who could have done a better job in bringing the joy of underground exploration to both cavers and non-cavers alike. The book is attractively presented and nicely bound. The hardback sold out very quickly but softback copies are available here.